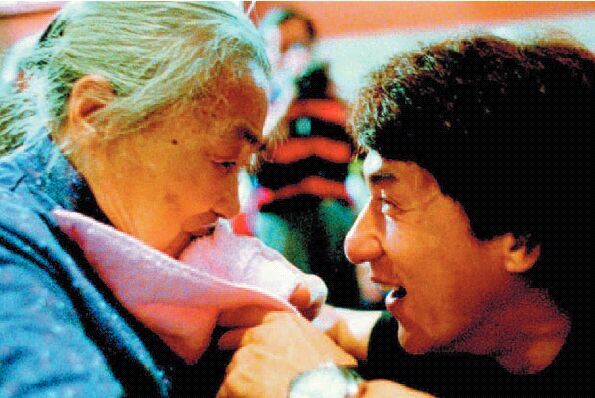 Did you know that since 1993 Jackie Chan has been the Ambassador for Operation Smile China Medical Mission? Operation Smile is a non-profit volunteer medical organization that helps children who are born with facial deformities. It provides reconstructive surgery (and other medical services) to children around the world. Jackie will inaugurate the Friends of Operation Smile Campaign at a press conference at the Hotel Miramar at 3:30 PM in Hong Kong on Saturday, March 1. Click here for more info about Operation Smile. If you happen to be in Hong Kong (AND you are a member of any of Jackie's International Fan Clubs, including the Kids Club) you are invited to stop by the JC Group offices and pick up money saving coupons for some excellent shops and restaurants. The JC Group has lined up these special privileges as a way of ensuring that Jackie's fans have a great visit to Hong Kong during any season of the year. Thanks to the JC Group! Click here to watch an interview with Jackie from a Los Angeles television news program. Well, okay....it's actually a lot bigger. It's 30" x 20" - it's HUGE! And it's gorgeous. Click here to learn all about this new contest! Under the category of "It's About Time," Highbinders has been given a release date of October 17, 2003. According to Movie-Source.com, the highly anticipated Highbinders will have a wide release in the U.S.
Well in case you thought you'd seen it all, have a look at these pictures which were created by pasting seeds on a board. They're really cool! 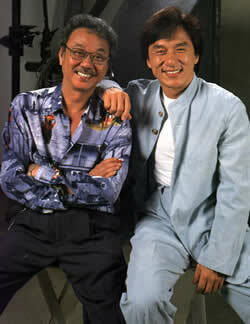 Thank you to David Steinlicht for sharing these pictures with the Jackie Chan Fan Club for Kids. Keep those birthday cards coming in! Jackie Chan has recommended American-born actor Daniel Wu for the part of a villian in Around the World in 80 Days. Daniel is managed by Willie Chan/The JC Group. Thanks to Marie for providing this news and its source. Suggestions for cameo appearances in ATW80D are flowing in. Click here for the list so far.....and mail in your idea! Have a look at an interesting article from the February 21st New York Times in which Willie Chan (Jackie's best friend and manager) talks about Jackie. Click here to read the article. Click here to read an interview with Owen and Jackie conducted by Emily Blunt. It's pretty funny. Don't forget.....who would you like to see in a small role in Around the World in 80 Days? Many people have written in already with suggestions and some of them are very clever. Send your idea to the webmaster. Also, visit the Kids Club Around the World in 80 Days page AND the Jackie Chan Birthday page. 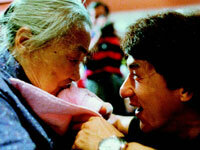 After 30-something years in the film industry, Jackie Chan has just filmed his first screen kiss. And, as he told journalists in London today, it took a British actress to show him the ropes. 'I just had a big kissing scene with Claire Forlani,' the star explained. 'I was shy, she just grabbed me saying "Come On." It was for my new movie Highbinders. The scene's at the end of the movie, and she kissed me and she didn't care. She said "Jackie, your hands  touch me! She really made me comfortable." As the star explains, romantic scenes have been something of a thorny issue for him. 'I always have a girlfriend but no kissing  that's a Jackie Chan movie. But things are changing slowly,' he added. 'My fans are growing up with me. I'm an adult, and now slowly we have a love scene in my movies. Now, if they write a love scene, it's OK with me. But writers have got used to not writing a love scene for me. Even in America, the screenwriters see my movies and say, "No love scene". And if there is one, the studio cuts it!" Hmmm....well, for those of you who have been watching Jackie Chan's films for the last 30 years or even for the last 3 years, you will recall that Jackie is no stranger to kissing scenes in his movies. Perhaps Jackie had a moment of anmesia when he gave that interview? Click here to see a picture of Jackie getting many kisses from many co-stars. Don't click if you think kissing is yucky. Thanks to Jewel for creating this terrific Collage of Kisses! Hard on the heels of the box office success of Shanghai Noon and Shanghai Knights, comes a third outing in the series - Shanghai Dawn. Well anyone who has read the information on the Kids Club Around the World in 80 Days page knows that the 1956 version of this movie is well known for featuring countless celebrities in cameo appearances! 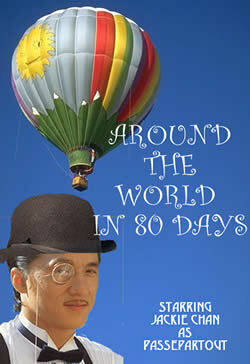 Who would you like to see in a cameo appearance in Around the World in 80 Days? Email your idea to the Kids Club webmaster and she'll post the list - and keep adding to it as ideas come in! Don't worry kids....this isn't the new poster for the movie! It's just the webmaster playing around. However, if you'd like to learn about the next movie that Jackie will be starring in, click the poster above! 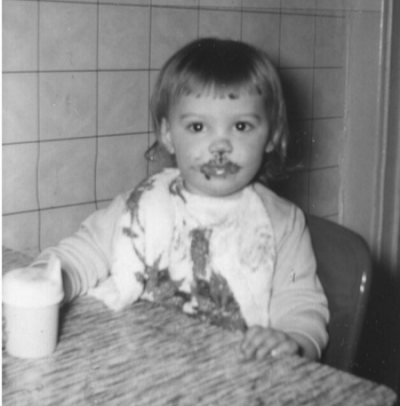 Don't forget....Jackie's birthday is April 7th and you should be working on your card if you want it included in the Birthday Cards to Jackie packet. Click here for all the important details. There's a new contest coming up soon....and the prizes are very cool. One hint: it has to do with Shanghai Knights and its possible sequel, Shanghai Dawn. Check back soon for all the information! Not much news today. However, if you would like to learn a little bit about Jackie's next project, Around the World in 80 Days, click here. This page will be updated as new information becomes available. Be sure to check back often! The Latest Jackie News for yesterday and today was delayed by the HUGE winter storm that swept up the East Coast of the United States, dumping several feet of snow all over the place. The webmaster was very busy digging out and having fun with a friend. This just in from Yahoo! Movie news: "Shanghai Knights" wrangled $750,000 in South Korea (better than "The Tuxedo" and "Rush Hour 2"), $365,000 in the Philippines (No. 1, although below "Tuxedo"), $330,000 in the Taiwan capital Taipei (also No. 1, but not as potent as "Rush Hour 2") and $330,000 in Hong Kong. Click here to read a great article on the Jackie Chan Adventures television show. Want a good laugh? Then click here to go to the Yahoo Movie site where you can see the complete outtakes from Shanghai Knights! They're very funny. At this same site you can view trailers and film clips from the movie. Shanghai Knights opened in the number one spot in Hong Kong this weekend and is going strong in fourth place in the USA. Congratulations to Jackie and Owen!!! Did you like the soundtrack of Shanghai Knights? If you find yourself humming some of the tunes, then click here for the words to two of the songs from the film. Jackie's birthday is April 7th and if you want to send him a card click here for information. Hey, we'll BRB BC there's a POS. * What!? Well in case you haven't heard, there's a whole new language that's spreading like wildfire. It's called "text speak" and it is the shorthand way of sending text messages back and forth to friends on a cell phone. So what does this have to do with Jackie Chan, you ask? It would seem that Jackie has become a part of the text speak. When someone is having a problem deciding on the best thing to do in a situation, they can just ask WWJCD? (What Would Jackie Chan Do?) Although this shorthand "WWJCD?" has been around for a while with different meanings for the "JC" part, it is only in the last few years that Jackie Chan has become the standard for behavior. So the next time you're faced with a tough decision about what the right thing to do is, just ask yourself WWJCD? Why not make a Jackie Chan's Favorite Oreo Smash Cake for your special Valentine? It's easy! Click here for details. There are two great new drawings in Jackie Chan Art Gallery Three. Thank you to Kids Club members Alan and Kendra for their contributions. 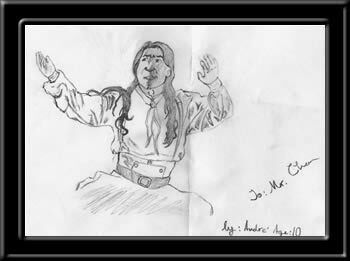 For those of you who are new to the Kids Club web site, you really should visit the Jackie Chan Art Galleries to see the beautiful drawings and painting that have been sent in. 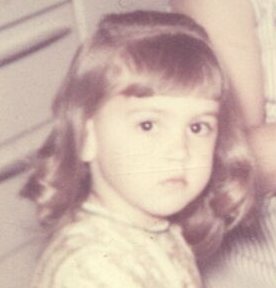 Don't forget that Jackie's birthday is rapidly approaching. Why not join us in sending Jackie a birthday card? Click here for all the important information. So far we've only gotten TWO cards (and they're beauties). It looks like there's a lot of last minute well-wishers out there. Don't lose out on your chance to have your card sent along in the special birthday card packet that the Kids Club sends! Remember: you don't have to be a Kids Club member OR a kid to send a card!! Some Around the World in Eighty Days news: The role of Philias Fogg will be played by Steve Coogan. Click here to read the whole article. 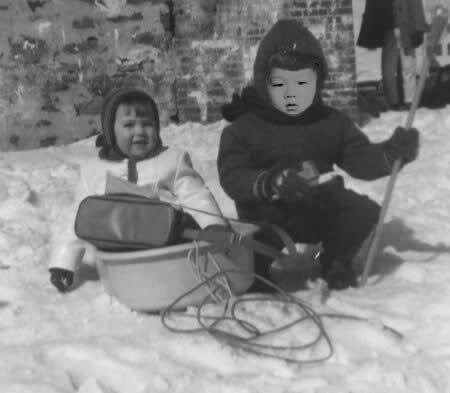 Click here to read a very interesting story about the making of Traces of the Dragon (the film about Jackie's lost family). Wow! You really really have to see Shanghai Knights. This reporter saw it again last night and enjoyed it even more than the first time. Shanghai Knights is just plain wonderful! It is enjoyable from the very beginning until the last credit rolls off the screen. It is packed full of action and comedy and fun! So cancel any plans you had this weekend and GO SEE SHANGHAI KNIGHTS!!!!! Here are two more stills from the movie. These are from the Korean Shanghai Knights web site but were brought to the attention of the Kids Club webmaster by Seung Ho. Thanks so much! Click here to listen to a 17 minute long radio interview that Jackie had with DJ Rick Dees in Los Angeles. The box office numbers are in for the opening weekend of Shanghai Knights and it has done very well, bringing in $19.7. The film came in second place right behind the romantic comedy "How to Lose A Guy in 10 Days." 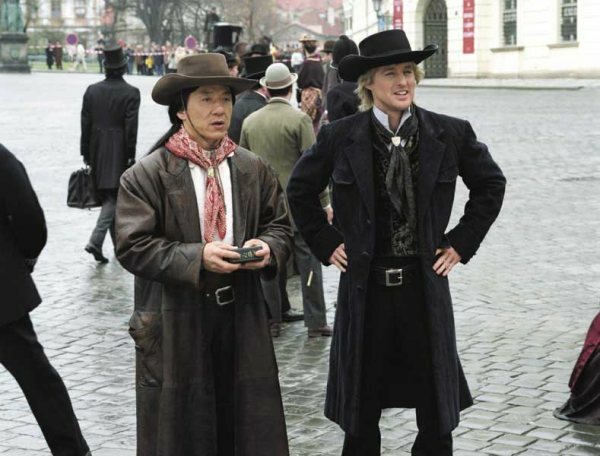 Shanghai Knights actually outdid the numbers for Shanghai Noon's opening weekend. If you've seen the movie and would like to relive some of the funnier moments, click here for a collection of clips and trailers. There's a nice article about Owen Wilson at the Washington Olympian. 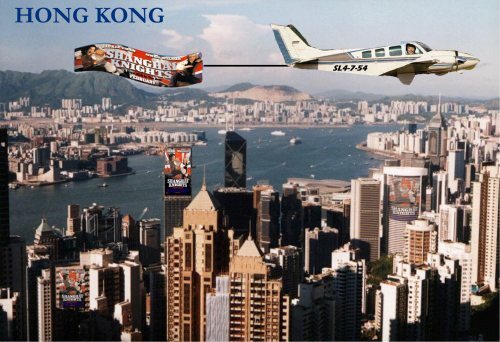 Hmmm....that pilot flying over Hong Kong to promote Shanghai Knights looks a lot like Jackie Chan. Click here to see a whole bunch more of these fantastical promotions! Shanghai Knights continues to do quite well in the US with an estimated weekend gross of $20 million. Jackie is in Berlin right now for the screening of Traces of the Dragon, the movie about his family and other families like his. Click here to read a review of Shanghai Knights by the Kids Club webmaster. This review contains **SPOILERS** so don't read it if you haven't seen the movie! Ebert and Roper have given Shanghai Knights two thumbs up and the good reviews keep coming in from around the country. Entertainment Weekly gave the movie a "B" and said that Jackie's is "a talent not so much cooling down as getting cool in middle age." 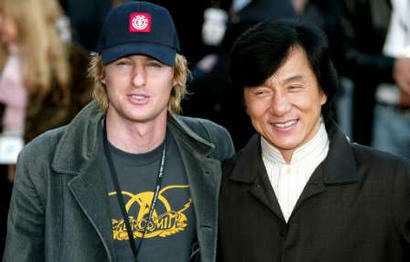 The perfect chemistry between Owen Wilson and Jackie Chan is mentioned over and over. Congratulations to Jackie, Owen, Fann, and all those involved in the production! Click here to read #Jewel's# translation of a report from Berlin about Traces of the Dragon - the documentary about Jackie's family which is being screened at the film festival there. Thank you #Jewel#! Congratulations to Jackie and Owen on a job well done. Positive reviews are pouring in from all over the country. It's official: Shanghai Knights is a hit! Click here for a page of links to movie reviews. These reviews contain SPOILERS!!! Jackie is making the rounds of talk shows on US television this week. Today he is in New York City. He appeared on Good Morning America and Regis and Kelly. He's scheduled to appear on MTV's Total Request Live this afternoon. Unfortunately this reporter can't give you any news about the appearances because she doesn't watch the shows (an attempt to NOT see scenes from the movie before it is released). However, there will be information on these appearances after this weekend when this reporter will review all the shows she taped. Jackie made an appearance on the Rick Dees radio show yesterday. Click here for TONS of great photos from Jackie's visit! There is a cool contest at CountingDown.com. Click here for information. This contest is for US residents only. There have been a few additions to the Totally Fun Jackie page. Most of these things appeared in the Latest Jackie News and then disappeared when the news was archived. Well, they're back! Speaking of disappearances, a newly discovered photo album of snapshots from 2001's Knight of the Dragon charity concert has just been found. The webmaster forgot that she'd made this photo album last year. Anyway, it's been posted on the web site. Click here for the Knight of the Dragon photo album. The page may take time to download as there are 142 thumbnail images on it. The images in the album are also large. They are in no particular order - they were just put there for those who are interested. Shanghai Knights premiered last night in Hollywood at the el Capitan theater on Hollywood Boulevard. There were many famous stars who came out for the celebration. Here are some photographs from Yahoo News site. These photographs are all ©2003 REUTERS/Fred Prouser. 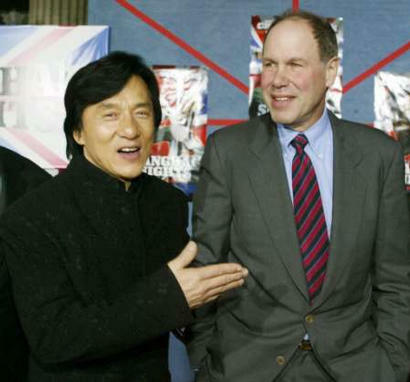 Jackie with Disney CEO Michael Eisner. Jackie and Owen arrive at the premiere. Jackie greets some very happy fans. Thumbs up for Shanghai Knights! Before heading off to the premiere last night, Jackie and Owen appeared on The Tonight Show starring Jay Leno. They talked about some of the funny moments on the set of Shanghai Knights and shared their high hopes for the movie. Jackie will be appearing on many many news shows in the following days, so keep checking your local listings. Here's a tentative list provided by Marie M.
Visit the Kids Club Chinese New Year Page or click here to see some beautiful drawings of Chinese New Year contributed by Sue Clayton's class in Texas, USA. Click here to visit one of the best websites for information on the Chinese New Year. There has been an addition to the Shanghai Knights television listings page. Thanks Marie M. for keeping the Kids Club posted. There's a neat poll on the Hot Ticket Site where you can vote for the Jackie Chan movie that you think has the best moves. Remember - you're not voting on you favorite movie...you're voting on the movie you think had the best moves. Claire Featherstone, organizer of the Tae Kwon-Do Association of Great Britain's Martial Arts Championship in Exeter, England, credits Jackie Chan for directly affecting the increase in the number of youngsters who are involved in the martial arts. Says Featherstone, "A lot of it is to do with films such as The Matrix and Jackie Chan coming back. The kids have got back into martial arts and tae kwon-do is well known, as shotokan is in karate, everybody has heard ot it." Are you the next Jackie Chan? Click here to read about auditioning for NBC television's new summer show "Next Action Star." Please visit the Jackie Chan Art Galleries to see all the wonderful work that Jackie's young fans have done. Jackie and Owen are both scheduled to appear on Jay Leno on Monday, February 3rd. 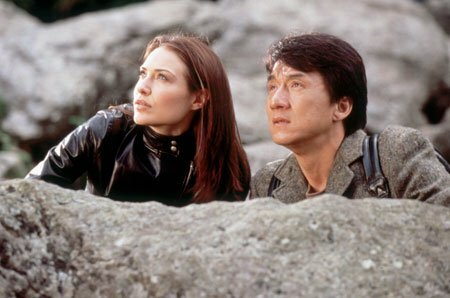 If you go to www.tvguide.com you can do a search for your area's local listings of Jackie Chan appearances. There is a whole page of listings for the first two weeks in February for Eastern time in the US. Check it out!